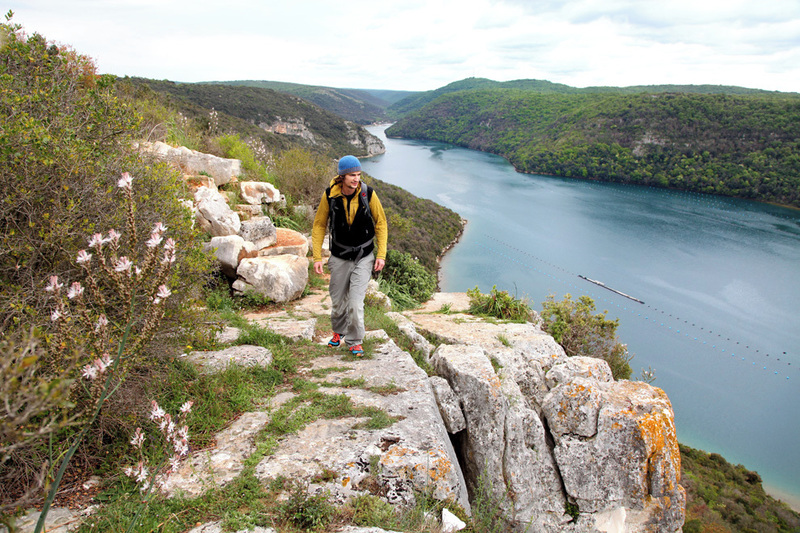 Discover the Istrian peninsula, a Mediterranean pearl in the northwest of Croatia. Visit small medieval hilltop towns that resemble Italian Tuscany. Groznjan, a 1000-year-old hilltop town, home to many artists and galleries. Go for a stroll through Porec and see the Byzantine mosaics that are part of UNESCO’s World Heritage. Bale village is famous for its top-quality virgin olive oil. Visit the archipelago of Brioni islands, a former summer residence of Yugoslavia’s President Tito. 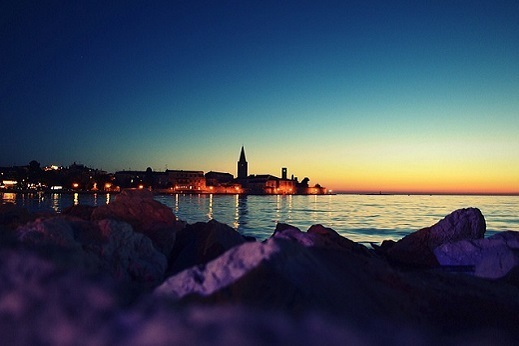 End the tour in Rovinj, a beautifully preserved old Venetian town which is a highlight of the Istrian peninsula. 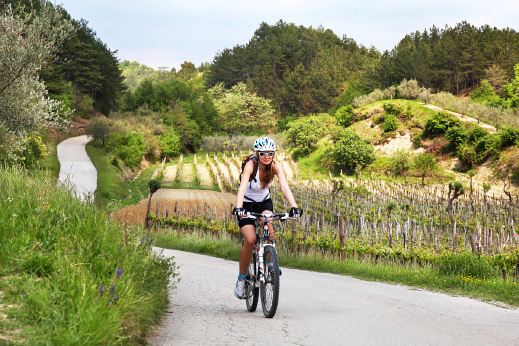 Explore Venice or check out our Cycling Highlights of Slovenia tour. 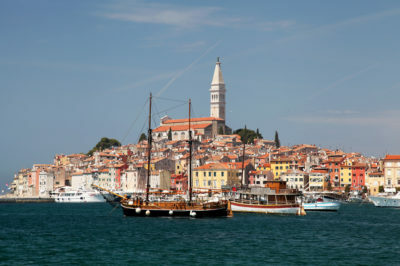 The Istrian peninsula is a region of northwestern of Croatia that enchants its visitors with its deep-blue sea and green rolling hills rich with olive groves, vineyards and lavender gardens. The best views can easily make you think that you are somewhere in Tuscany, but without the crowds. It offers so much that it recently became one of Lonely Planet’s top regions to travel to. We start our cycling tour in Brtonigla, a typical Istrian medieval town. Today’s ride takes us through medieval villages with archaic churches, green rolling hills and vineyards. Welcome to Green Istria! The highlight of the day is a visit to Groznjan, a small renaissance town on a hill that dates back to the beginning of the past millennium. It is known as a city of artists where almost every door leads to an art studio or gallery. 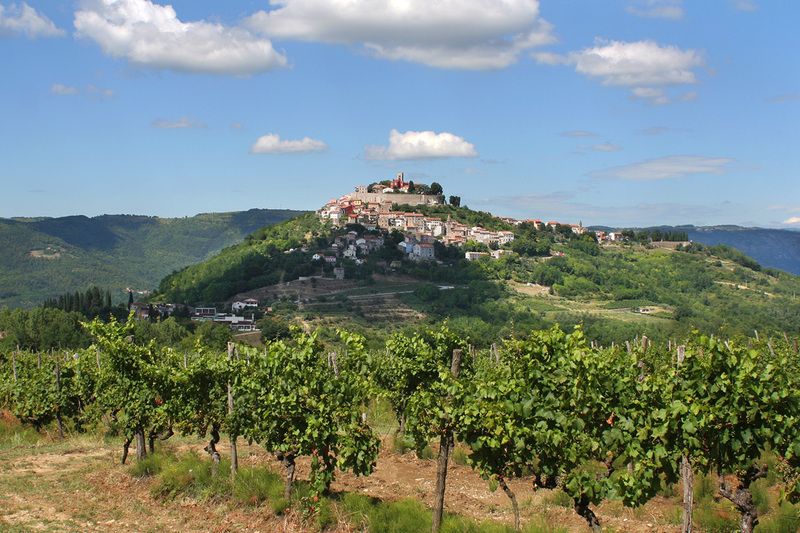 Today´s final destination is the hilltop city of Motovun, which overlooks the vineyards. Each summer Motovun hosts an international film festival that attracts artists from all over the world. The Motovun forest creates a favorable environment for truffles, which grow underground and are “hunted” by especially trained dogs. Why not start an evening with a fine dinner of truffle dishes? The homemade fuzi pasta with truffles is the stuff of legends. Our boutique hotel for tonight is built in a 500-year-old building in the old part of town that used to be a palace. Today our ride takes us through the heart of Istria, away from the usual tourist route and past small picturesque villages. The old church of Vrh is hiding an unexpected treasure-trove of frescoes created made by medieval masters. Cycling far away from the tourist crowds on roads practically devoid of traffic, there is a feeling that time has stopped in these parts a long time ago (though luckily the wine is still flowing). This afternoon you can relax in the hotel’s pool and spa area. 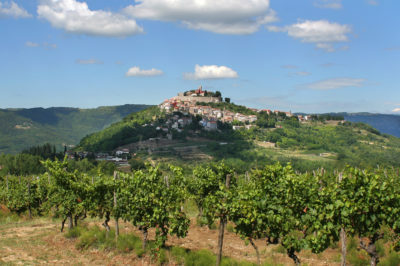 In the evening you can enjoy a jazz concert on the square of Motovun, surrounded by local music lovers. The experience would not be complete without a glass of good Istrian wine – we recommend the exquisite Malvazia, the region’s best white wine, while those preferring red varieties will not be disappointed either. We wake up to sweeping views of the kingdom of truffles and enjoy the leisurely atmosphere of Motovun over a long breakfast with great Italian coffee. Today we leave the green rolling hills and vineyards of inland Istria behind us and head to the seaside to explore what blue Istria has to offer. Our route takes us through prehistoric Illyrian fortified settlements. We finish the day in the town of Porec, which was once part of the Venetian republic. A magnificent 7th century Euphrasian pre-Byzantine basilica, today part of UNESCO’s World Heritage, is well worth the visit. This evening you can enjoy seafood dinner, tasting the fresh catch of the day. We turn south, stopping on the way in Vrsar, once praised by Casanova himself for its lovely women and excellent red wine. From there we ride along the coast and enter the Lim Fjord, which cuts deep into the peninsula. Magnificent panoramic views of the sea open from the top and we might spot several mussel beds beneath its surface. Continuing along the trail we reach Bale, a perfectly preserved medieval village. Bale village is famous for its annual jazz festival as well as a traditional olive oil festival hosting all Istrian producers. Here you will find old stone houses with picturesque facades and rosemary growing on the windowsills, and most importantly, top-quality virgin olive oil. Today we set off on Istrian side roads to reach the coastal village of Fazana, where we board a National Park boat for a short trip to the famous archipelago of Brioni islands. The islands played an important role throughout history. In the ancient times Brioni were known to be a favorite retirement place of Roman legionnaires and in the 19th century they became a distinguished Habsburg health resort that attracted aristocracy from all over Europe. In Yugoslavian times the islands became the summer residence of President Tito, where he hosted dignitaries and celebrities from all over the world, such as JFK, Elizabeth Taylor, and the Queen of England. 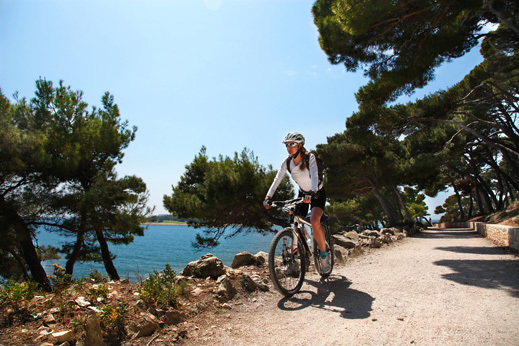 We cycle on the main island’s paths, which are closed to traffic, and absorb the beautiful Mediterranean landscape. In the afternoon we explore the city of Pula at the tip of the Istrian peninsula where a well-preserved ancient Roman amphitheater still stands almost 2000 years after its construction. A local historian tells us the stories of the Roman Empire. We finish the day sampling some of the best olive oil produced in Istria. Cold-pressed and virgin, of course. It’s time to leave Bale and head for the city of Rovinj. Our route today takes us along narrow gravel roads passing some of the nicest white-pebble beaches in Istria, where you can have a refreshing dip in the deep blue Adriatic Sea. We pass by the natural reserve of Palud, where wetland vegetation provides shelter to a wide range of animals. For those who love bird watching, this is the right destination. 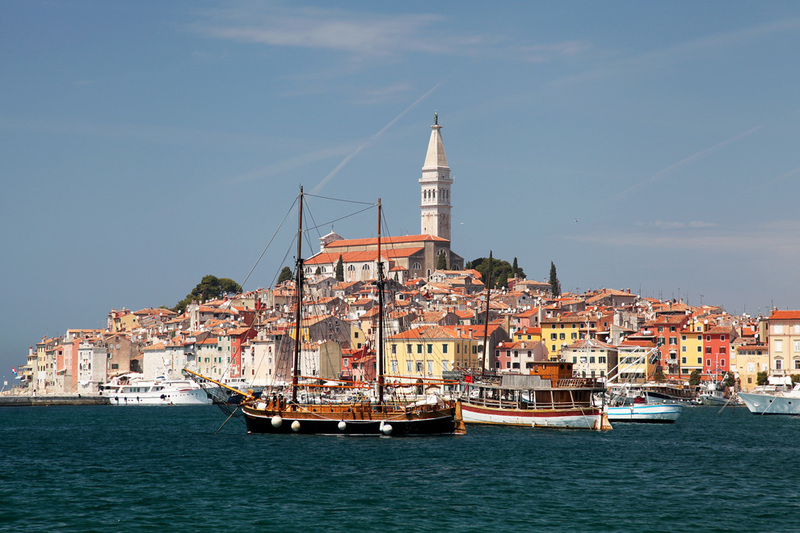 A relatively short ride on the last day of cycling gives you enough time to explore the magic of Rovinj, which is a beautifully preserved Venetian town on the Adriatic coast. 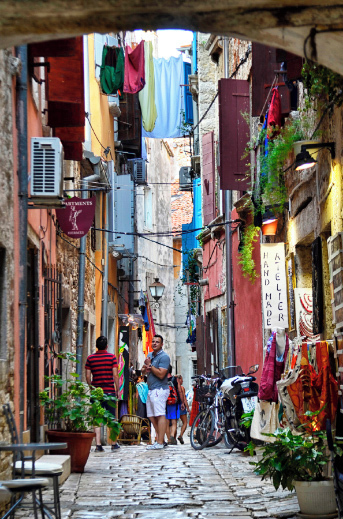 This vibrant old town is an enchanting maze of narrow cobbled alleyways lined with cafes, restaurants, antique shops, and many secret corners for you to explore. This morning we end our tour. You can extend your vacation or opt for a transfer to Ljubljana/Pula/Trieste or Venice airport. Wow, wow and wow. Thank you Trek Trek for organising our private cycle ride of Istria . Our bike tour ran seamlessly and exceeded all our expectations. Looks like you are a bit of a foodie Luka? 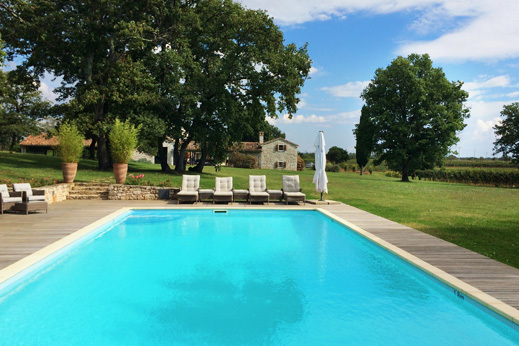 The hotels and restaurants you chose for us were perfect, everything from the very start of our enquiry, the planning of our tour to very end was a wonderful, professional and very personal experience. You made us feel like we were your only clients! This was a very memorable trip indeed. We have just returned from a marvellous time in Croatia. The itinerary you suggested for us in Istria and Plitvice National Park was perfect. All the places visited during our tour, we enjoyed every one of them. The hotels were also great. Thank you very much.